Our company is led by the highly experienced mother and son team, Marcy Hamed and Joad Hamed. Marcy, a veteran of the cruise and travel industry, is the very accessible and hands-on founder and co-owner of American Discount Cruises & Travel, an award-winning travel agency that's one of the world's leaders in cruise deals and discounted all-inclusive resort packages. With her leadership and knowledge, we are able to offer a top of the line program for independent contractors of all backgrounds. 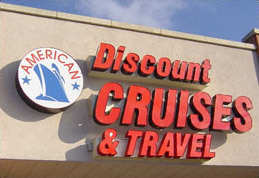 Among the many benefits of being affiliated with American Discount Cruises & Travel is that Marcy, unlike executives of many other travel agencies, is available on a daily basis to our independent contractors. She's is a great resource to have access to, whether you have a situation that requires a typically inaccessible executive at a cruise line, or if you'd like a first-hand experience of just about any destination in the world (because she's been just about everywhere). Co-owner, Joad, was was named one of the 35 Rising Stars Under 30 by Travel Agent Magazine in 2011, is certified as a Elite Cruise Counsellor by CLIA, and is a member of the Travel Agent Advisory Boards of both Royal Caribbean and MSC Cruises. A part of the ADC family since the company's inception, he oversees daily operations with Marcy, and leads the web development and marketing aspects of our organization. Custom projects can be coordinated by Joad, including one-of-a-kind web sites for independent contractors, including the integration of online booking engines for your clients to use. The sky is the limit! Our corportate office is located at 376 Route 9 North in Englishtown, New Jersey. All of our independent contractors are more than welcome to stop by to say hi! You'll have the opportunity to meet many of us at our seminars and special events. We have a well-organized management system in our company, with years and years of experience in the travel industry. This enables you to have a true expert on all issues right at your fingertips. Besides having an in-house leadership role, our management is also an invaluable asset available to all of our independent contractors. Whatever the issue, you always have someone to go to. We'd be nowhere without our dedicated, helpful and always willing to go the extra mile support staff. These energetic members of our organization are who you (and your clients) can go to for any reservation needs/services. Whether you need help invoicing a client, have a customer service issue that's driving you nuts, or if you just have a general question, our support services staff is a great resource available to everyone. Among our support staff are specially trained members that are available for any support issues that specifically deal with group travel. Such staff members are experienced with group support, including amenity and inventory management.